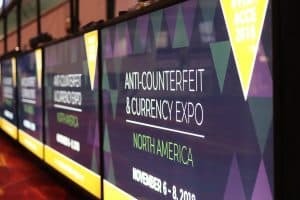 More than 800 attendees converged to the Las Vegas Convention Center November 6-8 for the first-ever Anti-Counterfeit & Currency Expo (ACCE). The ACCE is the only conference in the United States specifically focused on counterfeiting of currency. Attendees were a mix of retailers, casinos, government agencies, bankers, solution providers and financial technology experts. With a fantastic lineup of more than 35 expert speakers, the focus of the conference was to share best practices in cash management and the mitigation of counterfeiting of currency. An estimated 70 million in counterfeits bills are in circulation, or approximately one counterfeit note for every 10,000 in genuine currency. Some data suggests the problem is as big as 200 million counterfeits, or one counterfeit per 4,000 genuine notes. “The effects counterfeit currency has on the back area of banks and cash processing centers” by Barbara Myatt, head, Americas and the Caribbean, Cash Processing Solutions. “Cage operations in the cage and cash handling in the gaming industry” by Cynthia Bolden-Swinson, director of cage operations, Venetian/Palazzo. “Cash trends in Brazil: Unique banking alternatives used by consumers, difficulties experienced by retailers, as well as key inhibitors for Brazil to move away from cash” by Jessica Pohlen, product manager, solutions, SUZOHAPP. “The importance of standardization in cash and an update on the cash visibility initiative” by Vivian Underwood, director standards development, GS1 US. There were multiple learning tracks at the conference. 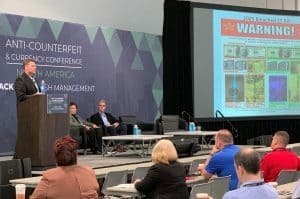 Track one focused on currency and secure documents topics, with banknote printing specialists, banknote designers, and other industry specialists detailing the strategies they use to defeat counterfeit attempts here in the US and worldwide. Track two dug into cash management challenges and trends, with stakeholders across the cash cycle presenting their view of the future. This track had a special focus on retail, casinos, commercial banking, and central banks. The conference showcased solutions that used data to improve cash handling processes. It also offered a deep dive into strategies for combating counterfeit currency in businesses that are heavily targeted by criminals. There was buzz about how smart safes and cash recyclers will lead the way to provide cash visibility to a wide spectrum of stakeholders. On display was the technology that has gone beyond the parameters of physical protection of the cash asset to now providing operational efficiency and actionable data for loss prevention, IT, treasury, and operations teams. Software providers contributed to the conversation by showcasing the next generation of their solutions that now feature artificial intelligence (AI) and machine learning, explaining how it will impact cash. Another highlight of the event was demonstrations of tamper evident bags and different ways criminals try to defeat their security features to access the cash inside. There were multiple networking opportunities throughout the three days of the conference, which started with a welcome reception evening event that included live entertainment and a preview of what was in store for the attendees. For more information, visit anticounterfeit-expo.com. LP Magazine was a media sponsor of the event. Shoe Carnival’s VP of LP Chris Atkins discusses methods to mitigate counterfeit currency in a retail setting. 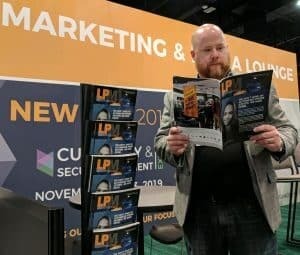 LPM’s Retail Technology Editor Tom Meehan represented LP Magazine (a media sponsor) at the ACCE conference.